www.ultimatehandyman.co.uk • View topic - Move radiator to accommodate fridge? Post subject: Move radiator to accommodate fridge? Hi how easy is it to move the radiator to accommodate a standard fridge of 65x60x186 ? Last edited by DRAK92 on Sat Mar 16, 2019 7:07 pm, edited 1 time in total. Post subject: Re: Move radiator to accommodate fridge? Depends how far you need to move it and the space available. Also not a great idea to put a rad next to a fridge, the fridge will have to work harder. Doesn't look like you can move the rad far cos of the door. 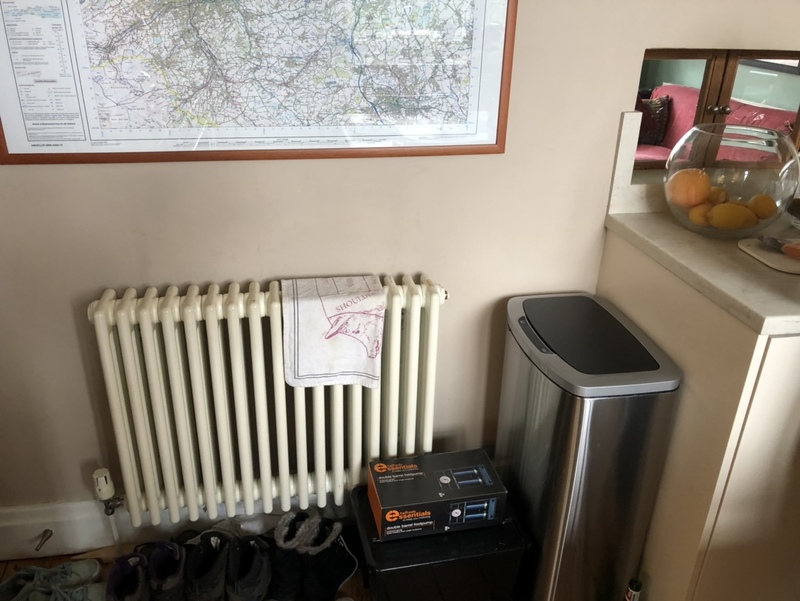 I would get one of them tall vertical designer rads and just move the return pipe (slightly less work) you should be able to get a thin enough rad to have enough space for a fridge freezer by the looks of things. I have a fridge freezer next to a rad and it's not that bad, I've just had to defrost the fridge to clear the drain, but had a freezer full of gear, 24hrs later the food was still frozen and my fridge is now working again, they are so well insulated it shouldn't make to much of a difference. I am sure you can fit a plinth or kick space heater under the cupboard, as to how easy it depends on how neat you want it to look, but with a fan assisted heater to output it high but the size is small. As ericmark has suggested above you could consider fitting a plinth kickspace heater as a viable option. I have two Myson kickspace heaters (500mm + 600mm) fitted at opposite ends of our kitchen and they work very well. Having said that I planned and fitted them during our new kitchen refit several years ago which made things easier. Also, a point worth noting is that they can be a little noisy especially the larger models. Although, as they are in the kitchen it doesn't cause us any problems. Looks like there is a door that opens onto the wall on the left of the rad, see door stop. Kitchen unit to the right. The op didn't specify where they wanted the rad moving to.